MLK. The man had a dream. 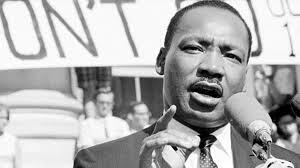 He wasn’t the only one that had that dream, but his voice was the catalyst for a shift. What that dream cost him was fatal—expensive. What that dream afforded America was hope and opportunity for change which is never easily accomplished. I hear and read constantly on social media about dreams. It seems we all have our favorite little saying on the subject. For the most part we think something is wrong if we’re not dreaming. The entitlement of our dreams is off the ledge. I too was once captivated by my dreams, but now looking back I can’t figure out if I had real dreams or selfish ambition or both. The lines between the two are vaporous. Most of the stuff I see on social media is selfish ambition that we’ve cleverly dressed as “my dream.” Be honest. When is the last time you dreamed for something that didn’t include you being at the epicenter? Does your ego require propping up and recognition every day? Can you create without anyone being enticed to notice? It takes a lot of guts to answer those questions honestly. The brilliance of the MLK dream—he wasn’t at the center. It was for the greater good of something bigger. Sure it would have benefited him, but it has also benefited all of us. Let’s talk about that dream.